# braces containing the arguments to that class's __init__ method. # the dataset made by make_dataset.py and use it as our training dataset. # want this example script to train quickly. # and learn the standard deviation. # and not use that hack here. # the model. Here we use stochastic gradient descent. # or to avoid overfitting, we could use held out data instead. # matching, which makes this RBM behave as a denoising autoencoder. # the raw data. 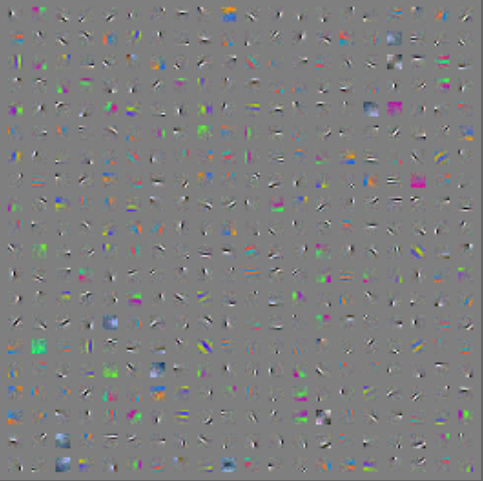 Here we use additive gaussian noise. # We'll use the monitoring dataset to figure out when to stop training. # make this criterion stricter so that the model will train for longer. # Let's throw a learning rate adjuster into the training algorithm. # handler that can be registered with the Train object. # This particular one is triggered on each epoch. # our learning rate hyperparameter less important to get right. Script implementing the logic for training pylearn2 models. syntax and this script takes care of the rest. __copyright__ = "Copyright 2010-2012, Universite de Montreal"
# Undo our custom logging setup. # and DEBUG and stderr for WARNING, ERROR, CRITICAL. formatter = logging.Formatter(fmt="%(asctime)s %(name)s %(levelname)s "
# Set the root logger level. # Publish a variable indicating the training phase. # Execute this training phase. # necessary for the next phase. epoch-level callbacks, and saves the model. raise RuntimeError("The algorithm is responsible for setting"
# which does not need inputs nor data. 当使用Pylearn2中已有的一些DL模型，采用其中已有的一些优化算法来做实验时，我们只需要配置好实验的.yaml文件即可，调参过程就是不断更改.ymal中的配置。但是如果需要采用自己新提出来的DL模型，或者采用自己新提出的目标函数及优化方法，则还需要自己写出对应的类，具体这部分该怎么做（比如说怎样去实现这个类，接口怎样设计，.ymal文件需要更改哪些地方等），本人暂时没任何经验。希望懂这些的可以大家可贡献贡献下想法，交流交流下。网上有个教程是把Pylearn2当做通常的python库来用，实现了一个异或网络，很不错，见：Neural network example using Pylearn2. pylearn2.datasets.exc.NoDataPathError: You need to define your PYLEARN2_DATA_PATH environment variable. If you are using a computer at LISA, this should be set to /data/lisa/data. -open an image viewer in a new process. -not return until you have closed the image. Neural network example using Pylearn2.